The Sea of Cortez spans more than 700 miles, but the typical Baja sailing itinerary concentrates on a much smaller area, starting from La Paz 137 miles north of Cabo San Lucas. The city of La Paz is itself a destination with varied attractions including museums, a performing arts theater, historic sites, numerous shops, and a delightful selection of small, intimate cafes and restaurants. Beyond the harbor is a hinterland of remote mountains and desert indented with snug coves and bays where the snorkeling is superb and the pristine white-sand beaches are some of the most beautiful in the world. Deserted islands dot the waters and provide a habitat for rare species of plants and animals. Observing dolphins, whales, and manta rays is a common occurrence (January through April) while you're enjoying a leisurely sail in balmy fair winds. La Paz to Celeta Lobos - 6.5 nm. 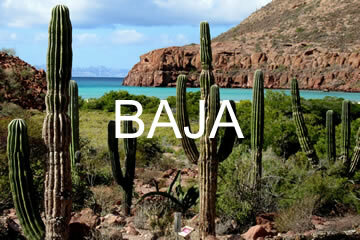 The first day of your Baja itinerary takes you northward across Bahia de La Paz into the Sea of Cortez. It will feel as if you've stepped into another world as you leave the city behind. The land rises in hues of red desert and rugged mountains soar skyward. Caleta Lobos (Lobos Cove) is only a couple of hours away, leaving you plenty of time to relax when you get there. Mooring: No moorings are available. The preferred anchorage is off the south shore clear of the shoal and mangroves situated at the eastern end of the cove. Things to do: Take the dinghy to explore the cove. There is an excellent coral formation in the west bight. Enjoy a relaxing dinner aboard your yacht. 15 nm. Your next destination lies in the Sea of Cortez beyond the peninsula that forms Bahia de La Paz. As you sail northward, the grand heights of Isla Espiritu Santo become visible a long way off. Nearly connected to this island is Isla Partida. Numerous sheltered coves line the shores of both islands. Sandy beaches, abundant wildlife, and stunning scenery are just some of the rewards awaiting you. One of the best anchorages in the area is in Celeta Partida (Partida Cove). Mooring: No moorings are available. One of the most protected anchorages in the area is in Caleta Partida (Partida Cove). It's located in the slot between Isla Espiritu Santo and Isla Partida. The bight in the north side of the cove is the preferred spot. Holding is good in a sandy bottom. There's a little fish camp ashore to the north. Pelicans like it in the cove. Also at Isla Partida you'll find ample room to anchor in scenic Ensenada Grande, a bay at the north end of the island. Snorkeling is excellent. Holding is good in sand. The main anchorages on the west side of Isla Espiritu Santo are Caleta Candlero, Puerto Ballena, and Bahia Santo Gabriel. Due to better protection afforded at Isla Partida, the anchorage there is well suited for overnight stays in unsettled weather. Things to do: According to The Nature Conservancy, Isla Espiritu Santo has the most intact ecosystem in the entire Sea of Cortez. On its more than 23,000 craggy acres live animals found nowhere else on Earth, including the blacktailed jackrabbit, the ground squirrel, and two species of snakes; 53 regional endemic species of plants grow there. Sea lions bask on the shores and more than 500 species of fish teem around the nearby coral reefs. This wonder of Nature is both beautiful and fascinating, well worth forays ashore, exploring by dinghy along the coast, and snorkeling to view the sea creatures on the reefs. José - 26 nm. Almost as soon as you leave the anchorage you've chosen on one of the twin islands, you'll sail past the rocky outcrops of the appropriately named Los Islotes; it's a protected marine preserve. California sea lions cluster on the shores, their calls and barks filling the quiet air. Vast numbers of sea birds wheel and dive overhead. Then your passage takes you across open water past Isla San Francisco and between the Baja peninsula and Isla San José, where you can anchor off the island for the afternoon to walk through the forest of giant cactuses, swim, and snorkel before sailing the remaining 10 nautical miles westward to scenic and well-protected Caleta San Evaristo. Mooring: No moorings are available. The best anchorage is east of Isla Cayo close to the beach off Isla San José on either side of a stream leading into a thick stand of mangroves. This is a day anchorage only because of the wide-open shape of the bay and its exposure to the northwest. Things to do: The cardón cactus is the largest type of cactus in the world. It can grow to 60 feet in height and live for two centuries. You've probably seen them in old Westerns. Not far from the anchorage is a cardón forest well worth exploring. Other smaller cactuses and plants grow among the giants. A hike to the hills overlooking the sea presents magnificent views. Miles of white-sand beaches perfect for shell collecting and swimming front the bay. Snorkeling is good in the area. If you want to explore in the dinghy, head into the stream and the channels winding through the mangroves. San Evaristo to Puerto Los Gatos - 26.5 nm. Still heading north, sail along the coast of Baja, its rugged heights ever present. As you approach your destination, the cliffs and plateaus of red stone rise off the bow. Within the bay are tall sand dunes. Black flows of ancient lava stand in stark contrast to the white-sand beaches that line the bay. Mooring: No moorings are available. There are three terrific anchorages in the bay. Holding is good in sand. Things to do: The beaches and rock formations are the main attractions of Puerto Los Gatos, along with the south and north reefs which provide excellent snorkeling. Puerto Los Gatos to Isla San Francisco - 33 nm. Turning the bow south, sail back down the coast of the Baja peninsula, leaving Isla San José to port. Three nautical miles off the south end of the big island is the stunningly beautiful and well-protected anchorage at Isla San Francisco. Shaped like a horseshoe, the bay is lined with a beautiful white-sand beach well suited for swimming, snorkeling, and shell collecting. Mooring: No moorings are available. The anchorage is off the beach at the south end of the bay. Holding is good in sand. Things to do: Climbing the hills for a view of the Sea of Cortez to the east is well worth the effort. Explore the beach, take a swim, go snorkeling, and spend a relaxing evening aboard your yacht. Isla San Francisco to Isla Espiritu Santo and Isla Partida - 20 nm. Next, your Baja itinerary leads you on a sail south, back to the natural splendor of the twin islands, well worth visiting again to do more exploring and to experience a new anchorage. If you didn't anchor in Caleta Partida, go there! It's one of the best in the area. Isla Espiritu Santo and Isla Espiritu Santo to Puerto Balandra - 7.5 nm. You leave the wide expanse of the Sea of Cortez in your wake and snug up along the west side of the peninsula that forms Bahia de La Paz on your last full day of sailing. As the coast passes to port, it won't be long before you reach the quiet and scenic anchorage at Puerto Balandra. It's just north of Caleta Lobos. White-sand beaches proliferate and the setting is spectacular with excellent views of the mountains to the west. Mooring: No moorings are available. The preferred anchorage is near the north shore to seaward of the giant boulder separating the first two beaches. Things to do: A dinghy ride ashore to walk the beaches and marvel at the 50-foot-high boulders is an interesting foray. At the south end of the bay is a saltwater lagoon hemmed in with a thick stand of mangroves. Fish abound in these waters. You may see a stingray or two as well as starfish. Puerto Balandra to La Paz - 10 nm. Although you won't want to sail back to reality (you can always come visit Baja again! ), the final leg of your Baja sailing itinerary is an easy passage south back to the Moorings base. Please check in by 10:00 A.M.